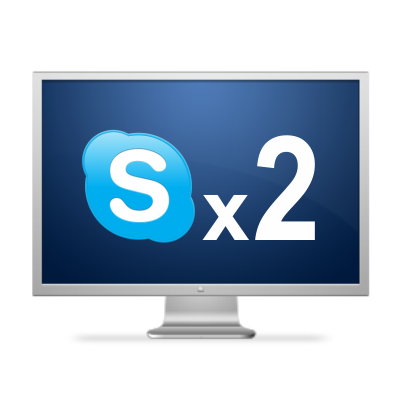 Have you ever wanted to start two Skypes at the same time? It would be useful. But if you try to open the program two times, nothing happens. And if you try to install it twice, then you get a message that Skype is already installed. What to do then? The first way, to open Skype twice, is with SkypeLauncher (called also green Skype). The second way is by creating a new Skype shortcut, and then adding a space and “/secondary” (without quotes) in the Target field in its Properties. The second approach does not work with a version older than 4. Here I will show you two methods for opening Skype many times on one computer (they work on Windows 7, Vista and XP). This way many accounts can sign-in on one device at the same time. Use the SkypeLauncher shortcut to launch Skype several times. If you are using Skype 3.8 and Windows 7, take a look at the first FAQ after the article. This method doesn’t require additional software, but it also doesn’t work with a Skype version older than 4. 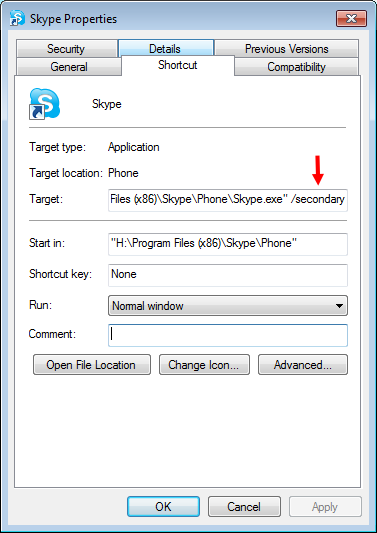 Open the folder, where Skype is installed, and then go to the sub-folder Phone. Right click on Skype.exe, click Send to, and then Desktop. This will create a new desktop icon (shortcut). Right click on the new icon and choose Properties from the menu. In the field Target add at the end one space and then “/secondary” (without quotes). From now on use this icon to start Skype many times. 1. How to open Skype 3.8 more than once in Windows 7? To do it, install Skype Launcher, open the folder where you installed it and start the file SkypeLauncher_Config.exe. Now click the button More >>, check the checkbox Force workaround for Skype < 4, and click Save. Use the SkypeLauncher icon to start Skype from now on. 2. How to install two different versions of Skype on one PC? This cannot be done. What you can do is to install one, and to use a portable version for a second one (it does not require installation). Keep in mind that in order to start them both at the same time you have to start the older first. 3. Can one Skype user sign-in two times on one computer? No. You will either get an I/O error, or an error saying that you are already signed-in. 4. Is it possible to use one Skype account on several computers at the same time? Yes. You can have only one account and use it to sign-in on multiple computers (or other devices) at the same time. In this case, if someone sends you an IM (instant message) for example, you will receive it on all devices. 5. How to make Skype start automatically twice and to sign-in automatically with two accounts on one computer? To do it, install Skype Launcher, open the folder where you installed it and start the file SkypeLauncher_Config.exe. There you can add the data for the two accounts with the Add button. Also check the checkbox Start Skype Launcher on Login, and click the Save button. What must I do to have more skype accounts opened in the same time when i have skype portable Version 5.8? Hi. The method without SkypeLauncher (described above) should work. Make a shortcut and apply the method. Hi guys. The article is now completely remade. It has a short and a detailed version and also 5 FAQs at the end :). Hi. Search in Google for Skype alternatives :). This works on new versions of skype. Hi Bob. I don’t know if you are asking or telling, but yes, it works. Hi. Why, what is the problem?